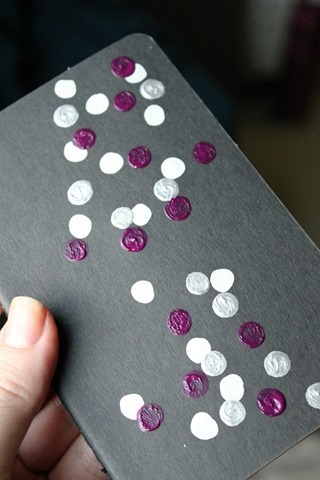 I’m in a crafty mood lately, so yesterday I decided to try my hand at the ‘Pinterest-popular’ eraser dot/stamping technique. 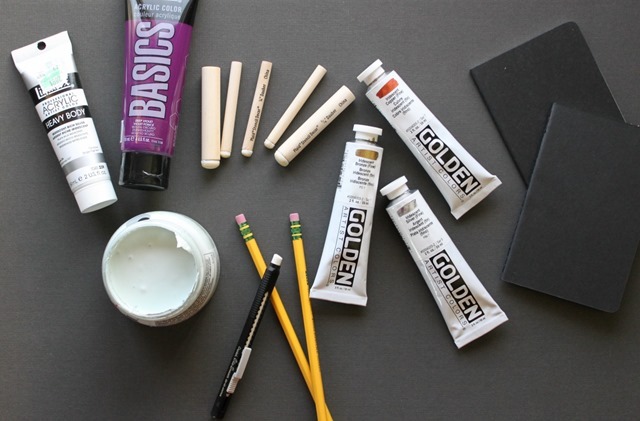 The basic concept is to use a pencil eraser as your paint brush. 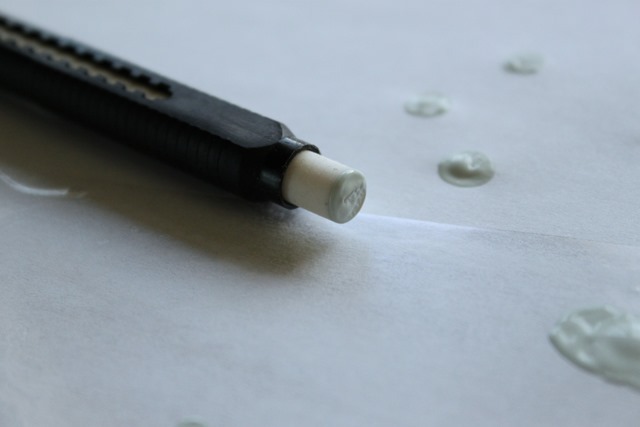 The project was fast, easy and since you can wipe the erasers clean…there was very little mess. 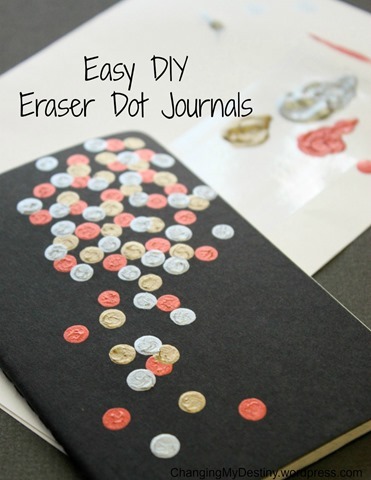 – Blank cover notebooks. 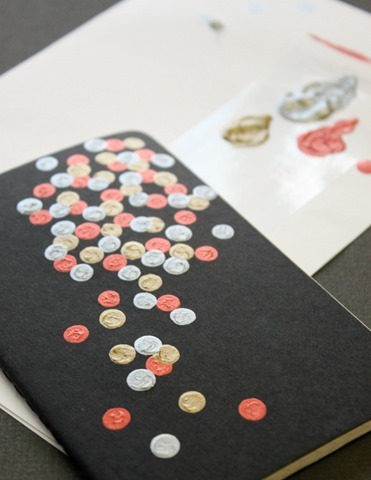 I used Moleskine Pocket Cahier booklets which come in a set of three. – Paint in your favorite colors. 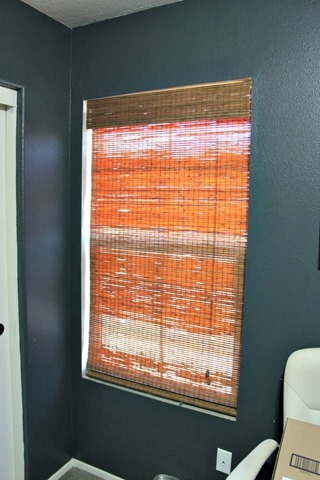 You can use any type of opaque paint for this project. I used Acrylic paints because that is what I had on hand, but you can use craft paint or even stamp pads for another cool look. – Classic #2 Pencils with pink erasers. I also tested the dot technique with a Pentel Clik Eraser and some craft Stencil Daubers. All worked, but the yellow pencil/pink eraser provided the best result. – Paper Towels and a little water for clean up, and small paint brush is helpful for any paint touch-ups you may find necessary. 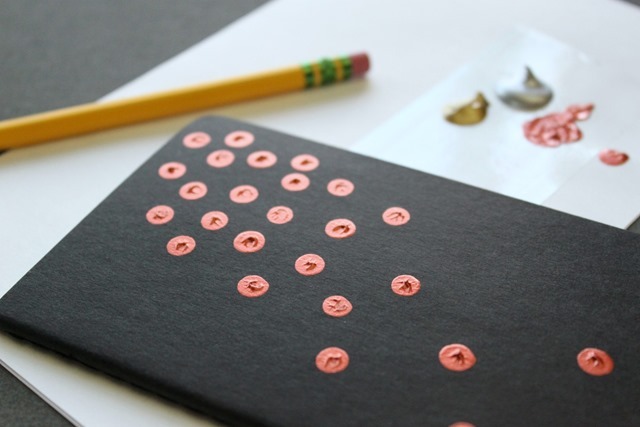 I decided to do the first notebook with metallic dots. I used the pencil eraser to dot copper dots on first. I found it helpful to keep a small paintbrush on hand to gently tap down any paint that peaked as you can see on some of the dots above. It’s not necessary to do this step, it was just my personal preference. 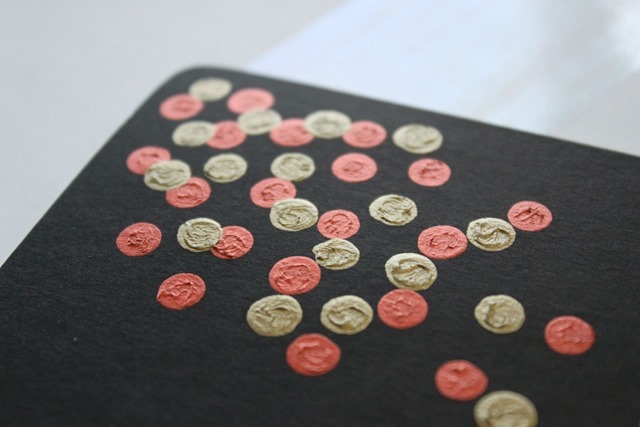 I gave the copper dots a minute or so to dry, then I used the same pencil eraser to dot on some gold paint. Then I added some silver dots. Since you are using such a small amount of paint, the booklet dries very quickly. SUCCESS! I love the finished journal! 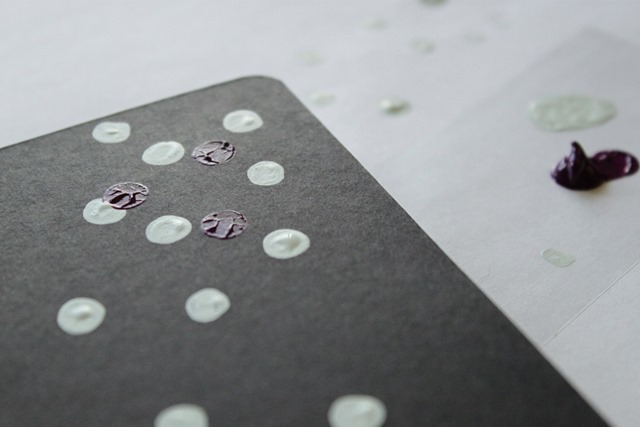 While the metallic booklet was drying, I tried using the Pentel Clik eraser to dot the other booklet. I used Aqua, Dark Purple, and Silver for this one. I didn’t like this finished booklet as much since the Clik Eraser didn’t stamp the paint as cleanly as the Pencil Eraser. You can see the difference in how poorly the purple stamped. That was partly due to the eraser and partly due to the type of paint. The aqua and silver worked just fine so I would recommend testing the paints you choose on a piece of paper before you stamp your final product. I had such good luck with the fist booklet that I didn’t test out the purple paint…but you live and learn. It’s still pretty in it’s own way and now I have two lovely personalized booklets to write in. Bonus, clean up was a breeze and the whole project was done in less than 20 minutes. These would also make great gifts to the book/journal lover in your life! 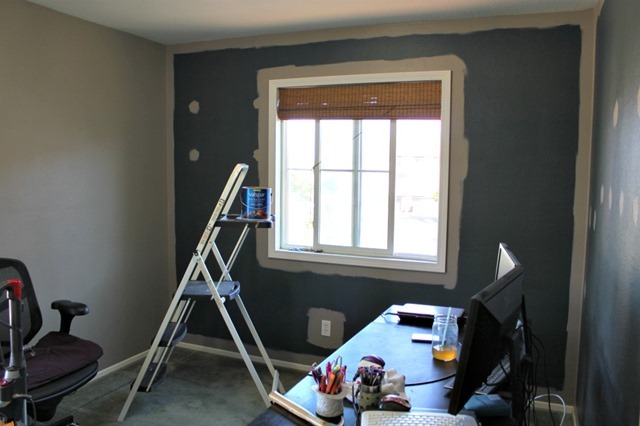 What DIY Projects have you been working on lately? My last beauty post covering my September Favorites was surprisingly popular, so I’m picking back up with my favorites from last month. 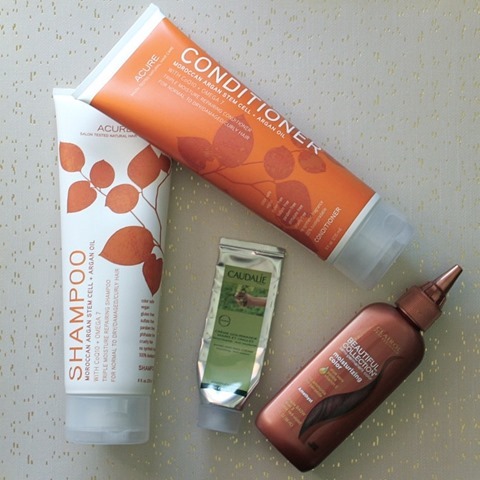 I’ve been a big fan of the Acure skincare line recently so when I needed new Shampoo I decided to give them a chance and I’m incredibly impressed. They have a subtle almond scent which is delicious, and I find that my hair is less oily when using this shampoo. The Conditioner is effective but light which is great for my fine/thin hair. Definitely recommend. I’m constantly using hand cream and I’m impatient when it comes to allowing lotion to soak in. The Caudalie hand cream has become my go to cream for when I’m working at my computer (which is always). I can apply, and immediately get back to work because it soaks in within seconds. The smell is classic Caudalie and a bit earthy but it fades rather quickly in case that bothers you. When I was in college I used to box dye my hair Burgundy, I loved it and miss it…but growing it out was awful. The brassiness, the orange, I don’t want to go through that again. But I still like to dye my hair on occasion, to boost my already dark brown hair with a pop of color. My favorite hair dye, hands down, is Clairol Beautiful Browns. You can buy a bottle at most beauty supply stores for about $6 and it’s Semi-Permanent which means it fades gently over the course of about 28 washings. No grow out, no odd roots…it just naturally fades over time. Plus, I can usually get quite a few uses out of that little bottle.I switch between Wine Brown (burgundy tones) and Amethyst (more purple tones). Indoors my hair looks dark brown, but outside it has a beautiful glint of red/purple. Great for anyone that wants to avoid Permanent hair dye. Josie Maran has the Argan skincare market on target, I’m a fan. I really like her cleansing oil, but last month I was reaching for her Watercolor Eye shadows all the time. They pack a punch in terms of color, dry quickly, and blend fairly easily with just your fingers. 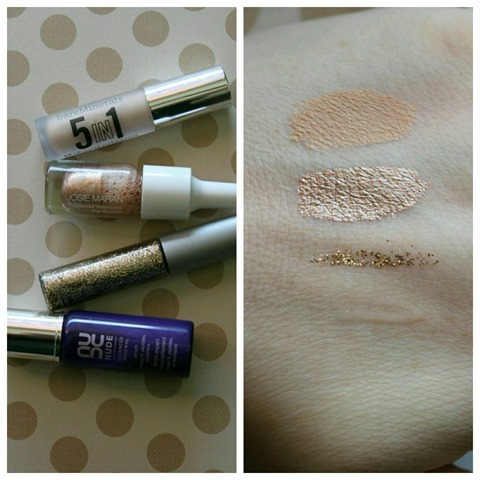 They work well all alone for a simple wash of color but really shine when paired with darker shadows. I’ve only own this one color, but I swatched the others at Sephora and they are all beautiful. December was the perfect month to break out the glitter eyeliner. I’m in my 30’s so glitter liners can be a little tricky, as sometimes it can come across as too young. That is actually why I like the Urban Decay liner, it’s buildable (as in the picture), but light in application. I wing out my eyeliner using black liquid liner, then gently add a thin line of glitter above the black. it adds the most beautiful sparkle when the light hits it, and in my opinion comes across very classy/elegant. I get lots compliments when I wear this one out. I also own the silver and copper colors which are also gorgeous, but the beige of Midnight Cowboy tends to blend into my lid color better to give the subtle sparkle. I haven’t yet splurged on the full size of this produce but it’s on my wishlist. This small size was part of a gift set that I purchased in early in December and I’m impressed. It’s light, soaks in immediately, and doesn’t compete with other skincare products. I use this at night and it leaves my skin feeling incredibly soft and moisturized. I haven’t been using it long enough to confirm any claims that it prevents the signs of aging or firms the skin, but I will say that I seem to have a good skin day after using this product. Whatever it’s doing, I like it. Thanks it! What Beauty products are you loving this month? *Some of the above links are affiliate links. Clicking through the links do not change the price of the product of you, but awards me with a small commission. Thank you for your support. I don’t typically set New Year’s resolutions as I prefer to set goals at my birthday instead; but this year I chose a mantra. Quit the job you hate, start a business, write the novel, take the trip, say yes, say no, take the chance, say I love you, believe in yourself, give more, dance more, laugh more, dream more, but in all you do, Be Brave. It’s disheartening how many things we don’t do because we’re scared…fear of failure, fear of judgment, fear of rejections, etc. Just imagine the amazing things that you could do for yourself…for others…for this world, if you were able to push past the fear. The fear won’t just magically disappear for me, but this year I’m choosing to be brave in the face of the fear and let those resulting actions help build the life that I have always imagined. For anyone who is on their own journey of challenging the fear, please share. I’d love to hear how others are doing, what goals you have, what challenges you are facing…we can all support each other through this exciting journey! I’m wishing you all an Incredible (and Brave) 2015! If you caught my recent 32 in 32 post, the first item on the list was to be Vegetarian. Truth be told, I transitioned to a Vegetarian lifestyle a few weeks ago, but it’s been a struggle. I don’t miss meat, at all. In fact my diet previously was primarily vegetarian, but I apparently psyched myself out. Since saying the words, “I’m Vegetarian”, I’ve gone blank on meal ideas. I’ve been eating lots of homemade Pita chips and hummus…but a girl can’t live on hummus alone (no matter how delicious it is). Enter Plated…and no, this is not a sponsored post or a referral link. 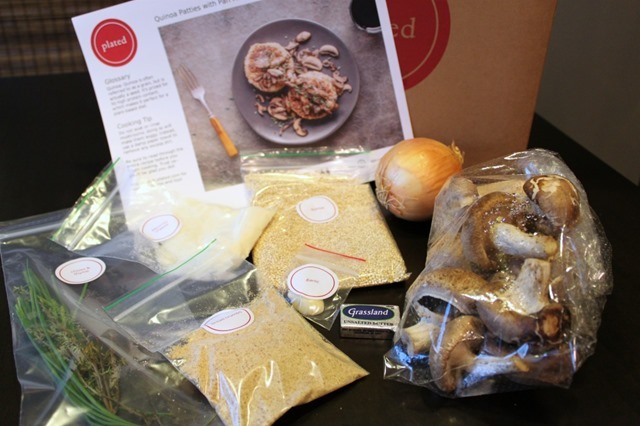 I signed up with Plated months ago and have made a few meals from them, all delicious. So when I needed meal ideas, I ordered a few vegetarian meals from Plated to try out. They send you nearly every items you need to make the meal and the recipe card. The only thing I had to supply was some water, an egg, and some olive oil. I will admit this can be an expensive option which is why I don’t use it regularly, but it was incredibly helpful to have some help when I needed it this week. 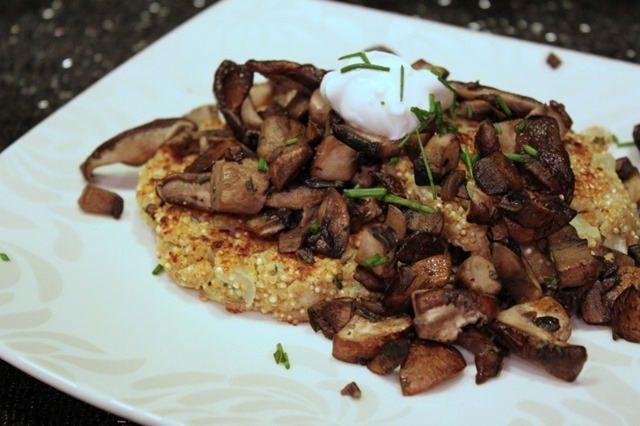 This particular meal was Quinoa Cakes with Pan Roasted Mushrooms. Simple. 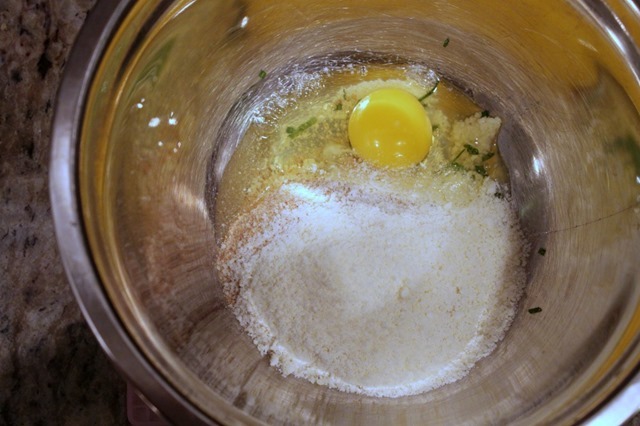 You can probably find hundreds of similar recipes on Pinterest…in fact, check here, I did a quick search for you. Plated provided the mushrooms, quinoa, onion, breadcrumbs, pecorino cheese, chives, thyme, and a pad of butter. 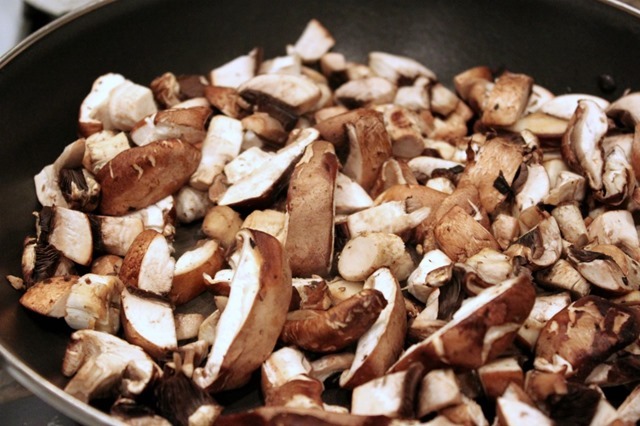 While the Quinoa was cooking with the onions, I used the butter to pan roast the mushrooms. Then added some fresh thyme near the end of cooking. 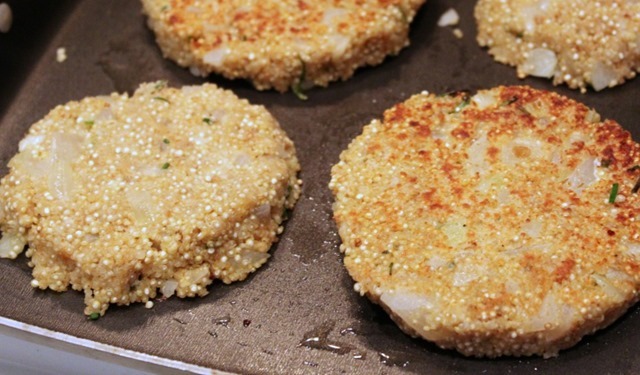 Once the quinoa was cooked, it was mixed with an egg, garlic, pecorino cheese, chives, and breadcrumbs; then formed into 4 patties (this recipe was service for 2). Sautéed in a little oil for about 4 minutes per side. I was worried they would fall apart when flipping, but they stayed together surprisingly well. Finished cakes topped with mushrooms, chives and a little sour cream (I added the cream, it was not in the recipe). It was delicious and filling. Exactly what I needed to break out of my hummus rut. I can’t wait to eat the leftovers tomorrow for lunch. I plan on making some more cakes, with my own twist on the recipes which I hope to share on here in the near future. What are some of your favorite vegetarian/vegan meals? Feel free to link your own blog below in the comments if you have Vegetarian/Vegan friendly posts that I can check out! 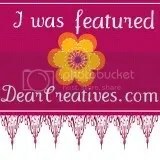 Or share your favorite Vegetarian/Vegan blogs, those would be helpful too. A few years back, when I was turning 30, I wrote out a list of things that I wanted to accomplish before I turned 31. I didn’t achieve everything, but I had a good time working on some of those goals. With everything going last year, I never got around to creating a 31 in 31 list; but I think it’s time to bust out the list again and attack it full force. Below I’ve listed out the 32 goals that I’ve picked to complete by 5/6/2015. I’m obviously getting a late start since I only have about 6 months until I turn 33, but I’m inspired to change my life and this is a start. As motivation to complete the list (and not just the easy stuff), I’ve decided that for every goal missed I will donate $50 to charity. So if I only achieve 25 of the 32 goals, then I’m shelling out $350 to charity. That’s not chump change so I feel sufficiently motivated, and now it’s out there for all to see as well. No hiding now. As cliché as it sounds, I can’t believe this year is flying by so quickly. Wasn’t it just January? I’ve been counting down the days until Fall, the heat this summer has been unbearable. Combine that with the drought we’re experiencing and it’s been pretty miserable. It’s going to be in the 100’s this weekend (in October?!? ), and I am dreaming of a cool, damp fall/winter. With the heat, makeup hasn’t made the ‘To Do List’ very often. I’ve been keeping it very simple with a foundation for even skin, and then I used blush and nail polish for pops of beauty color. 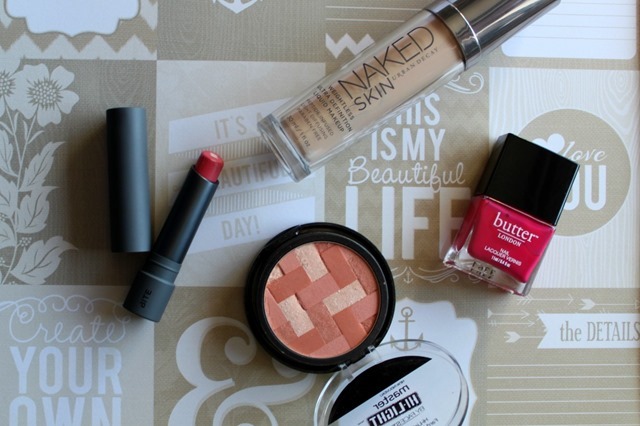 Here are a few of my beauty favorites from this past month. I love the Bite brand overall due to it’s focus on using Food Grade Ingredients. I feel safer using the Bite Brand products since we eat so much of the lip products we wear. I’m not very comfortable using bright lipsticks, so I have a special love for the Lush Lip Tints. They are moisturizing and give wash of color that feels comfortably colorful. Earlier this year I splurged on the Urban Decay Foundation when ULTA had a 20% off coupon available. First off, it’s a great color match for my light skin, which is often a challenge to find. The formula is great, light and comfortable even in the hot summer months. It also leaves a very natural finish, not cakey or heavy at all. I love bright coral-pink-red nail polishes. SNOG is a bright, but dark pink that is an absolute stunner! Easily a one coat polish as well, the formula is fantastic. If you want to try a similar color for less $$, check out an Essie polish in the color Watermelon.That polish is also a favorite of mine. This blush has been a favorite since the day I bought it. It’s better than many of the high end blushes that I have in my collection (yes, I said collection…it’s a problem). It’s the perfect Coral/Peach blush with just enough glow to also double as a highlighter. Excellent color, coverage and price (around $10 and often on sale). I still love my regular Coconut oil for so many reasons, but the Vatika Enriched Hair Oil has replaced regular coconut oil for my hair. 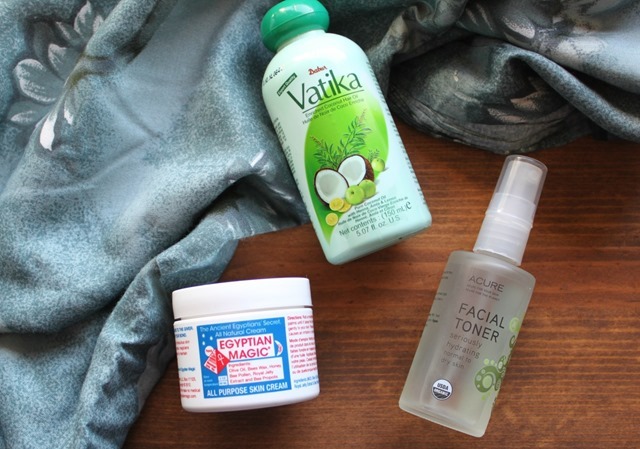 The first ingredient of The Vatika brand is Coconut Oil, but it also has Neem, Henna, and other herbs/extracts. It has a lemon scent and it does an AMAZING job at moisturizing my hair. My hair is typically very dry and frizzy, but with this stuff, my hair has never been healthier. I use it about once a week, overnight. I haven’t had any problems with it staining my pillows either. Since my skin tends to run on the dry side, I use a facial mist morning and night. I’m a fan of the Acure brand and the Seriously Hydrating Facial Toner is excellent as well. It’s a great formula that is incredibly moisturizing, without being sticky. It soaks in quickly, and feels nourishing over or under other beauty products. Egyptian Magic is not cheap, but it’s so worth it! I picked up the 2oz bottle (shown) and a 4oz tub at Costco for about $40. The texture is more oil/balm than cream and you don’t need much at all. A few times a week, I will wash my face and apply the Acure Toner, then a facial oil, and lastly a very thin layer of Egyptian Magic. It soaks in and leaves the most incredible glow/softness to my skin overnight. What Beauty products are you loving this month? *Some of the above links are affiliate links. I’m going to just jump right back into blogging and hope you don’t realize that I’ve been MIA for about 6 months…sorry. Reality is that I needed a break. I tried to come back earlier this year, and as much as I wanted to blog, I couldn’t get the words out. I started so many posts over the past few months and they sit unfinished. So I figured a break was in order, always knowing that I would be back. 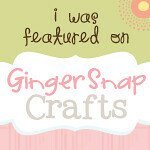 So here I am…and I have some exciting projects to share with you. Please bare with me as I get back into my writing groove. But first…Thank you for all the kind notes that were sent to me over the past few months. So many of you were encouraging me to come back and that meant so much to me. I greatly appreciate every single message/email. THANK YOU! 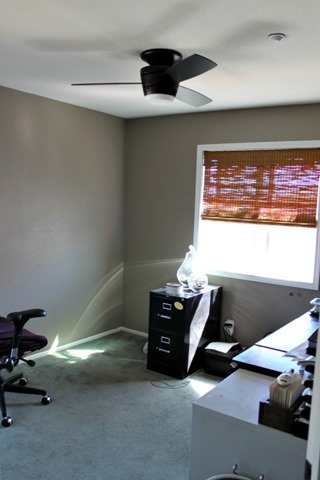 Two projects that have been a long time coming are a Office Remodel and a Backyard Update. I have a bit of cleanup to do in the yard, so that update will come later this month. 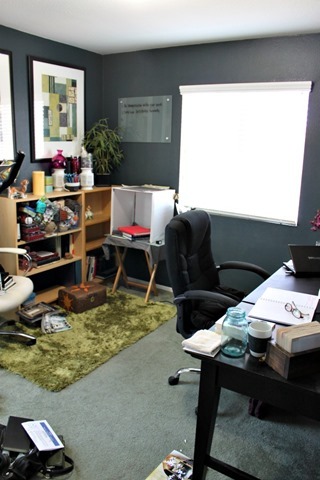 Today I’m excited to show you some progress in the office. Anyone remember this (very messy) room? I can’t recall the last update I provided, so we’ll start here. First I had to clean…a lot. 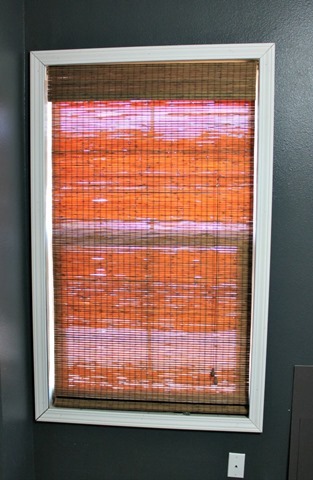 Next I swapped out the broken white wood blinds for bamboo blinds. Then I added molding to each window to create the architectural frame. For such a small investment, the effect is amazing in the (nearly) finished room. 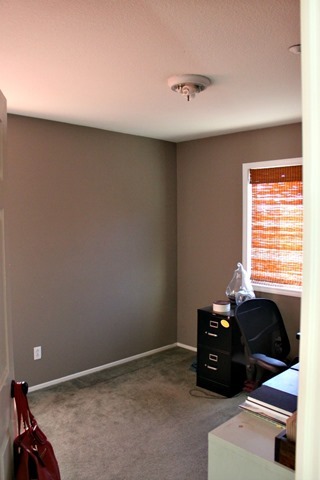 I wanted to pick something neutral for the walls so I could use accessories in different colors. I like to vary my decorations based on seasons and holidays, so a neutral color wall works perfectly. 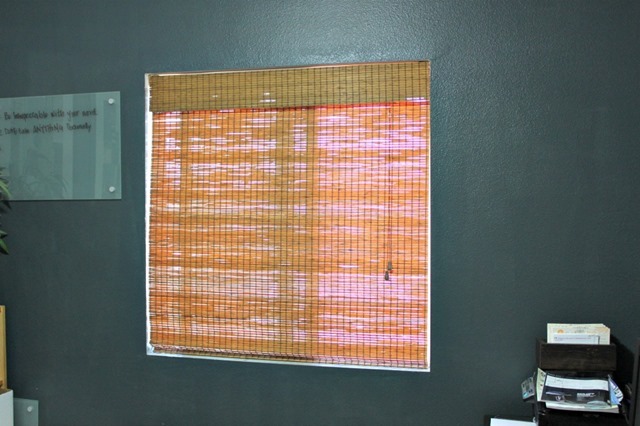 The color is Valspar Hot Stone. 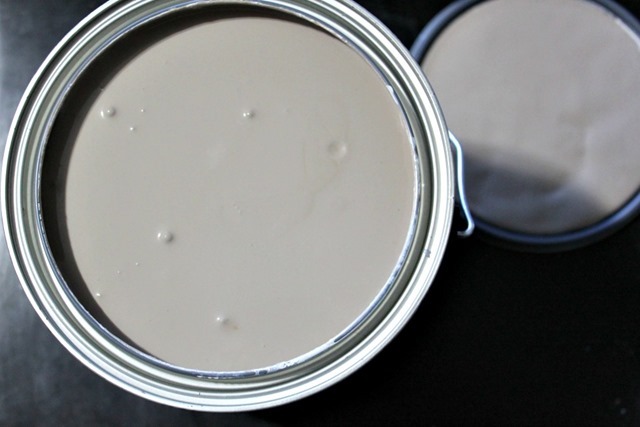 Depending on the lighting, the color can appear light brown or taupe. I do wish it were a bit lighter, but for now it works really well. After moving the desk and filing cabinets back in, I decided to tackle the lighting situation. 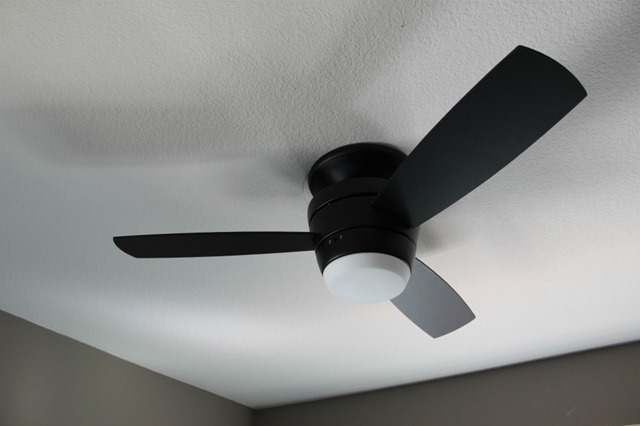 I also wanted to install a ceiling fan since the summers are scorching hot. …now looks like this! I loved the fan so much, I’ve added 3 more throughout the house. I found these beautiful black Allen & Roth fans at Lowes on sale for about $100 each. 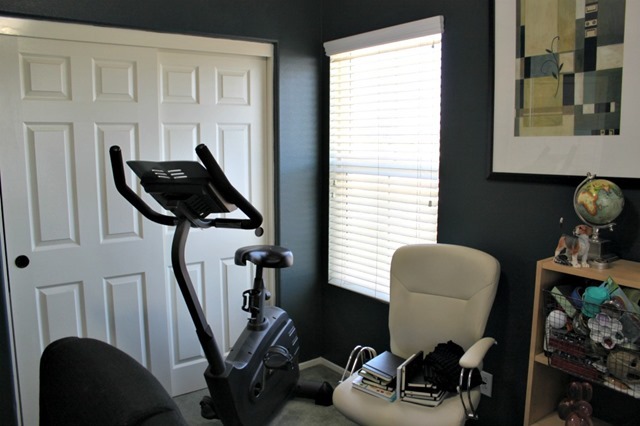 This model is no longer listed online; however, Harbor Breeze sells a very similar model (HERE). I’ll be back Friday (I promise! ), hope you are all having a wonderful week. Happy October!! I’m starting to break out the spring inspired nail polishes again. Shade of aqua, like breezy days relaxing at the beach. When it’s not aqua it’s coral. Speaking of, who’s seen the beautiful colors of the new OPI Brazil collection? I just got my order and am so smitten with the colors and formula. I cleaned my entire house this weekend. Top to bottom, front door to attic (just kidding, I don’t go in the attic. Spiders live up there). You get the point. I made a list for each room on Friday night, and plowed through it starting on Saturday and finished the biggest problem areas, like the kitchen, on Sunday. Not the most exciting way to sped a weekend, but it feels amazing to have a clean house. 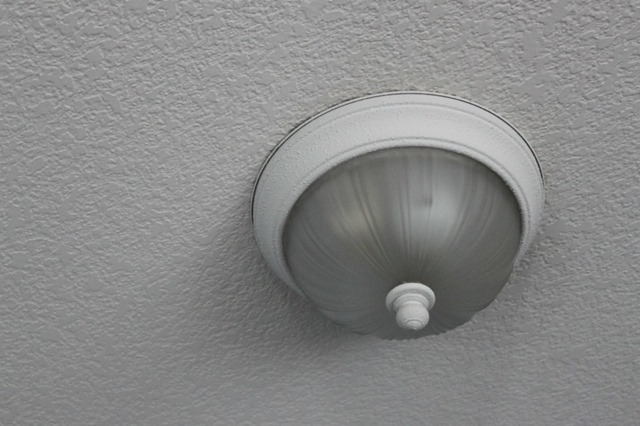 I also took care of a few random house chores, like installing a Carbon Monoxide detector, swapping out a few door bumpers, and replacing a toilet seat (never thought I’d actually have to know how to do that…joys of being a homeowner). The challenge now is to keep the place looking great all the time instead of having to do this type of cleaning again anytime soon. I put together a schedule to quick hit every room in the house twice a month to keep on top of things. I think I could do a quick 15-20 minute cleanup each day in the scheduled room, and keep on top of things. Quick cleanup would be dust, vacuum, pick up lose items, counters/toilets, fix any small issues. How do you guys tackle cleaning, do you keep any type of schedule/plan? Or do you do Super Cleaning weekends every few months? It’s only been in the past few years that I’ve experienced overwhelming anxiety, but much longer that I’ve been drowning in stress. Some days are worse than others, of course. I came across an article on Greatist.com this week and I really enjoyed it, 15 Ways to Beat Anxiety Now. If you deal with anxiety or high stress, you may enjoy this article as well. In the past I’ve always been a fan of technologically advanced beauty, but more and more, I’ve transitioning to a more natural beauty regimen. I still use non-natural brands and products, but I strongly believe that when you know better you do better. So I’ve started to embrace brands like Shea Terra, and Stark Skincare. I’ve also started experimenting with making some at home beauty products. So far my favorite thing is washing my face with honey! Amazing results & easy to make, and customize, at home. I’ll probably do a separate post on this in the future. 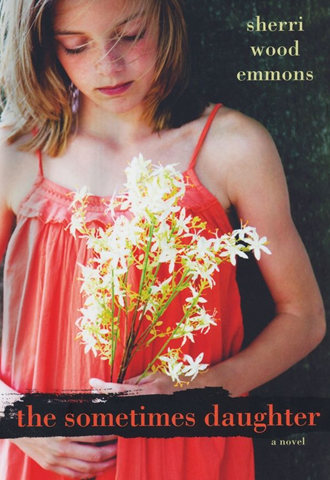 I finished the sometimes daughter by Sherri Wood Emmons last week. It’s the story of a girl born at Woodstock and her relationship with her mom and family as she grows into her teens. It’s a fairly simple story of watching a young girl grow up in the 60/70’s and experiencing her personal/family struggles. If you enjoy getting a glimpse into someone else’s family life (we’re all a little voyeuristic, right? ), then you’ll probably like this. I’ve been struggling a bit with my pup recently. He’s been having some mobility issues with his back leg. It always seems to be prompted by rough/wild playing, or a long day outdoors so I’m fairly certain it’s muscle strains. However, I think he is also developing some arthritis due to the extra weight he carries around. I’m having to adjust his food and add some supplements in hope of bringing him some natural relief without going to prescription pain killers. He’ll be seen by our vet in a few weeks for a checkup, fingers crossed, I’ve finally found the best nutrition plan for my little one. It’s so hard to see him struggle when I know he really wants to run through a dog park or splash at the dog beach. I hope we can get back to that soon. If your pup has had similar issues, any suggestions would be greatly appreciated. Alright, I’m off to collapse onto the couch and relax after all that cleaning. I hope you all had a great weekend! With my little disappearance act from the blog recently, I never did a proper New Year post. Don’t worry, I’m not going to launch into a recap of 2013…no need. It can pretty much be summed up in 4 words…Work, Jury Duty, Vacation. That covers a majority of the yearly highlights, sadly nothing else too extraordinary. I struggled with massive amounts of anxiety & stress last year which was a challenge, but I’m working to turn all that around this year. I have a feeling that 2014 is going to be a good one. Instead of doing New Year’s Resolutions this year, or planning any major goals to overcome, I decided to go a different direction. I created a Love List. One day, I was feeling particularly burned out and ‘blah’, so I grabbed some paper & pen, and scribble down 25 things that I love. They are very general, and I didn’t mean for it to be too specific. I wanted to create a list of things that I love, thing that brought me joy in life. I’ve posted the list below. You’ll notice that some are incredibly general. I did that purposely so that I could find all the bits of joy within that ‘love’ item. For example… #23 is Travel. General, right? I could have clarified that I wanted to travel overseas or to a specific country, and I do. But overall I simply love travelling. I can’t afford to do it often, but I love it. So it’s on the list. The goal will be to find ways to ‘travel’ in my area when I can’t afford to go far. The point of creating this list was to help me see the beauty around me on the tough days. On those days that seem to break me down, I can grab this list, pick a number and do something I love. Maybe it will be to curl up with a good book, or hop in the car with my pup and go to the beach, or add something new to the garden…hell, sometimes it will simply to be sit down and listen to the sound of the rain (check out Rainymood.com. It’s just the sound of the rain, INCREDIBLE). The Challenge is to pick several of these a week and make sure that I’m spending time doing things that I love. Sometimes with the ‘busy-ness’ that is life, it’s hard to find those happy moments. This is just one way that I’m trying to incorporate more HAPPY into my life this year. What is on your Love List? Want all the latest News? 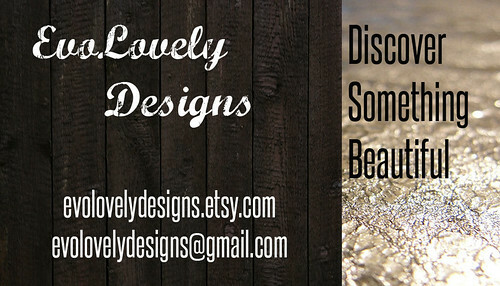 EvoLovely Designs ETSY Shop – OPENING AGAIN SOON! 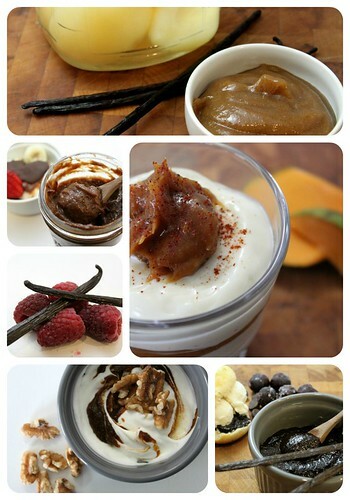 CrockPot Fruit Butter eBook AVAILABLE NOW! On Sale for only $5! Thanks for stopping by and checking out my journey to change my destiny. 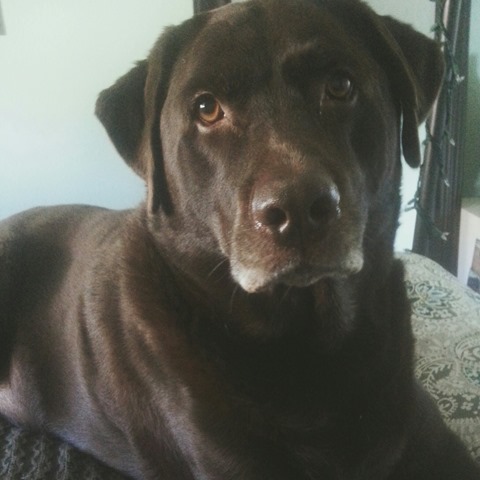 I'm a home decor addict, healthy living amateur, doggie mama, and a yogi wannabe. Feel free to follow my misadventures of weight loss, healthy living, home design, recipe creating, etc. If you want to see more of my random musings and inspirations, check out the Changing My Destiny Tumblr page.